Beets taste like dirt because they contain a compound called geosmin (meaning “dirt smell”). Geosmin is produced in abundance by several organisms that live in the soil, including fungi and some bacterial species in the genus Streptomyces. Humans are extremely sensitive to low concentrations of geosmin – so much so that we can smell it floating in the air after rain has stirred it up from the soil (Maher & Goldman, 2017). While people generally like that rain-fresh scent in the air, it’s less welcome elsewhere. For example, we perceive it as an off taste in water drawn from reservoirs with a lot of geosmin-producing cyanobacteria. In wines, geosmin contributes to cork taint. What is the origin of geosmin in beets? It has been surprisingly difficult to show that beets make their own geosmin rather than take it up from the soil or from geosmin-producing microbes that live on or in their tissues. One approach has been to use artificial selection to try to change geosmin levels. The logic is that if different beet strains can be bred to have higher or lower levels of geosmin, then geosmin may be under the control of the beet’s own genes and not simply subject to soil conditions or external microbes. A recent study (Maher & Goldman, 2017) reported exactly that: successful selection for high- and low-geosmin strains. The authors pointed out, however, that they could have been selecting for other traits that would influence geosmin levels indirectly, such as skin permeability or the tendency to host microbes. 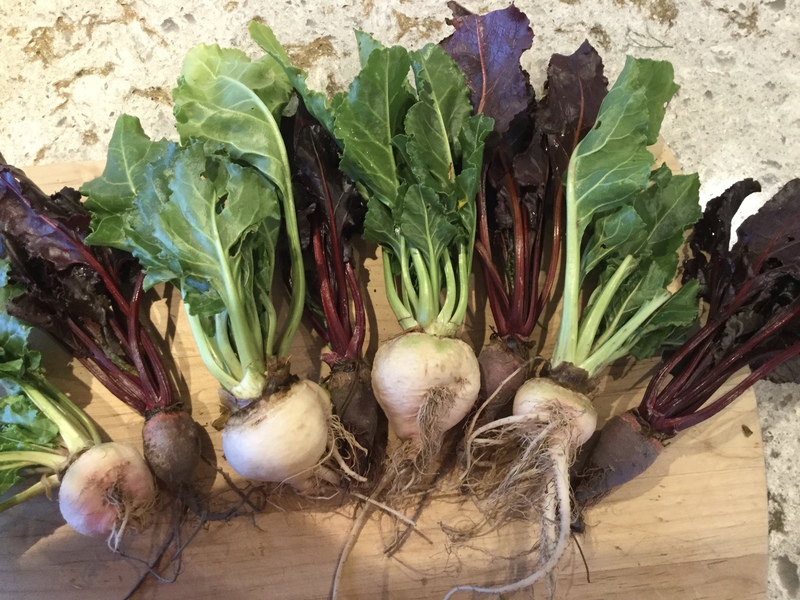 To address that possibility, the researchers followed up their selection study by growing several beet varieties under sterile conditions and measuring their geosmin concentration. They verified the sterile conditions by detecting no microbial DNA in their samples, and they found that beets nevertheless produced geosmin in the absence of any microbial contamination (Maher & Goldman, 2018). So there is pretty good evidence that beets make geosmin, but what does it do for the beet plants? That, we still don’t know. Everyone agrees that beets taste like dirt, but why do some of us seek out that flavor while others avoid it? There are many scents and flavors that attract or repel, depending on their context. Parmesan cheese smells like vomit, white pepper smells like wet dog, and expensive Italian truffles smell like feet. Geosmin flavor in water or wine is off putting because it indicates contamination (harmless as it may be), but we love it after a gentle rain because it belongs there. Beet lovers welcome geosmin as a normal flavor component of beets. Do beet haters, by contrast, attribute it to something unhealthy? It’s tempting to associate the mineral dirt flavor of beets with their bloody appearance. That could certainly explain the aversion. Fortunately, there is a way to reduce that particular flavor note: geosmin is odorless in acid (Gerber & Lechevalier 1965), so vinegar-pickled beets or fermented beet kvass will taste much less like dirt. Red beets – and even golden ones – have a hot brightness to their color that is not found in roses or tomatoes or radishes. Beet stems and roots appear almost fluorescent, as do the colorful parts of most of their relatives, including cactus flowers, rhubarb stalks, bougainvilleas, and four o’clocks. Chard is just a variety of beet, and so its leaf ribs also glow red, pink, and yellow. All of these plants belong to the order Caryophyllales and they use pigments called betalains, named, or course, for beets (Beta vulgaris). Betalains are a class of pigments that includes the red-to-violet betacyanins that dominate red beets and the yellow-orange betaxanthins that color golden ones. Betalains are special; they are found in no other flowering plant group except the Caryophyllales, and they never ever occur alongside the anthocyanins, the class of pigments responsible for most reds, purples, and blues in every other plant group. 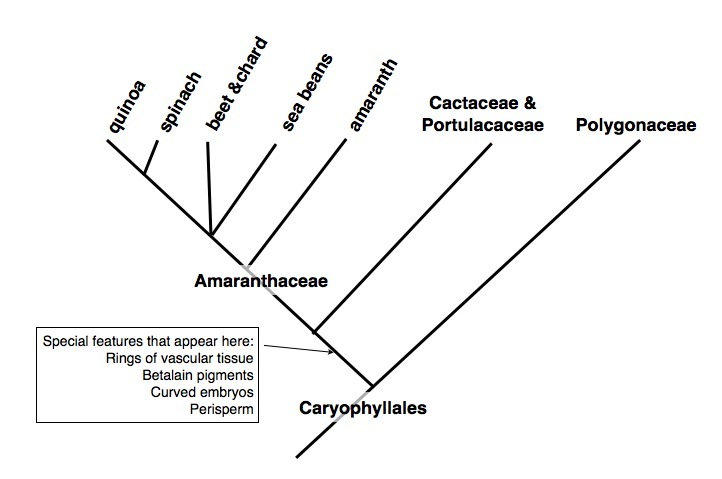 Relationships among edible species in the Amaranthaceae, which is part of the larger order Caryophyllales. Relationships and characters based on Judd et al. (2nd ed) and the Angiosperm Phylogeny Website ver. 12. Click to enlarge. Plants make pigments for many reasons – signaling to pollinators and dispersers, protecting cells from UV radiation, controlling oxidative damage, etc. – but it’s not yet clear whether betalains confer a distinct evolutionary advantage that explains their presence in the Caryophyllales. Betalains have recently been associated with gray mold resistance (Polturak et al., 2017), and they may help protect plants from salt stress (Davies et al., 2018), but no clear advantage has emerged. Two families in the group, including the carnation family, have given up betalains and reverted to anthocyanin production, which suggests that betalains are not always favored evolutionarily. Betalains and anthocyanins are never found together in nature apparently because their biosynthesis represents mutually exclusive pathways (Brockington et al., 2015; Lopez‐Nieves et al., 2017). The two classes of pigments are made from different amino acids (anthocyanins from phenylalanine and betalains from tyrosine) and there is a strong trade-off between these two amino acids. They share a common precursor molecule (arogenate), so each is made at the expense of the other. An important recent study showed that the betalain-producing Caryophyllales are so different from all other plants because they have a novel enzyme that allows cells to accumulate tyrosine instead of phenylalanine, thereby favoring the betalain path and cutting off anthocyanin production (Lopez‐Nieves et al., 2017). If that enzyme stopped working, however, the anthocyanin pathway could still function in these plants. That’s exactly what has happened in the two families that have reverted to anthocyanin production; they have lost function in the new enzyme. It may not be natural but it’s also not impossible for a plant to make both anthocyanins and betalains. Building on recently uncovered details of the genetic pathway leading to betalains, researchers have genetically engineered other plants to make them, including tomato. The plants expressing only betalains produced some bizarre looking hot pink tomatoes while those expressing both betalains and anthocyanins made more muted dark purplish tomatoes with a hot undertone (Polturak et al., 2017). Other aesthetically dubious successes included pink potatoes and eggplants with bubble gum pink insides. Given that these pigments are mutually exclusive in nature, it’s not clear how many species will be able to express both and whether they will face a metabolic cost (Osbourn, 2017). For the cook, one big advantage of betalains over anthocyanins is that they are color-stable across a wide range of pH values. While anthocyanins act like natural litmus paper, betalains keep their color and so have been used in natural red food coloring. (Jeanne uses them to dye Easter eggs). Because a tiny bit of beet juice goes a long way, it can be used to tint batter or frosting without dilution. 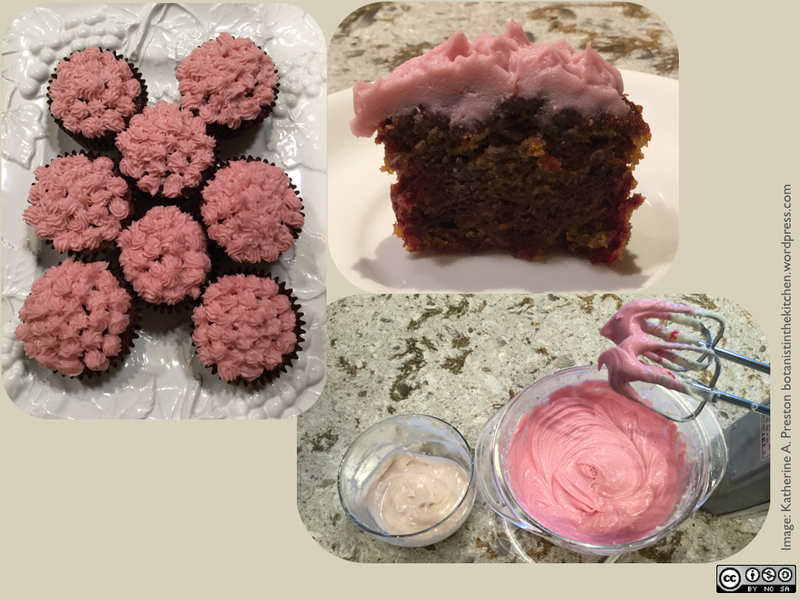 (See the recipe below for Valentine’s Day cupcakes with pink frosting.) Betalains also have very high antioxidant activity. Anthocyanins are pH sensitive, whereas betalains are stable across a wide pH range. 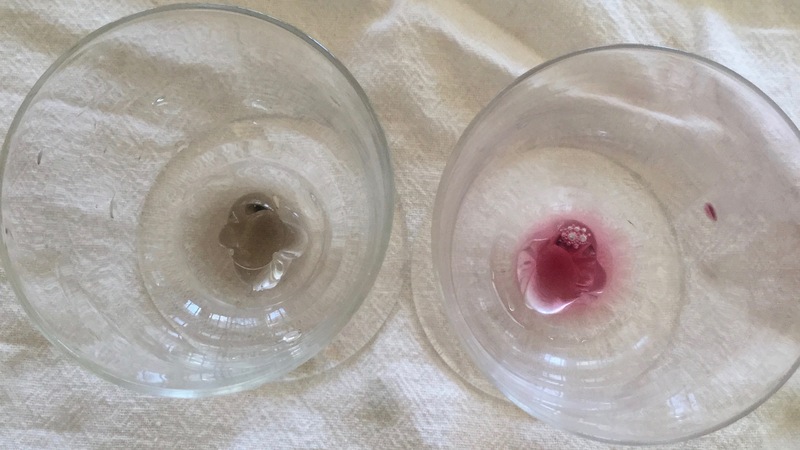 Pomegranate juice (left) turns grey when baking soda is added; beet juice (right) does not. 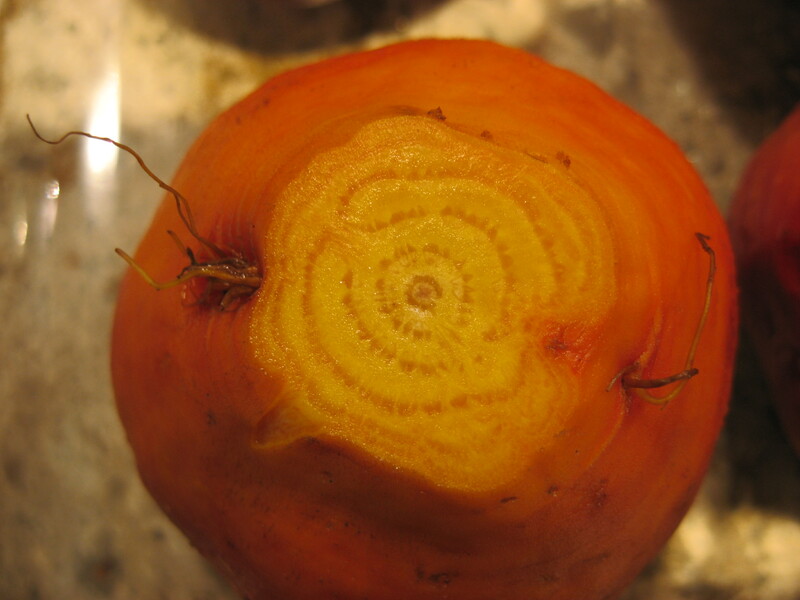 The kind of rings beets have – concentric circles of vascular tissue alternating with storage cells – are an unusual phenomenon in flowering plants. Radishes and turnips look a bit like beets on the outside, but they are very typical in having only a single cylinder of vascular tissue just below the surface to conduct water and sugar. Sometimes this tissue gets too woody to eat and must be peeled away. Carrot roots are almost entirely vascular tissue, with their water conducting cells (xylem) in the center of the root axis. Ginger and turmeric have bundles of vascular tissue scattered throughout their stems, including in the underground stems (rhizomes) that we eat. But beet-like rings are rare, except – you guessed it – in the order Caryophyllales. What’s most unusual about beet rings is that each includes its own thin layer of actively dividing cells, a vascular cambium, that spins off new vascular tissue: xylem cells towards the inside to conduct water and phloem cells towards the outside to conduct sugar. In the stems of trees and most plants, there is only one vascular cambium and it functions just under the surface. The bulk of a woody stem is dead xylem “left behind” by the ever expanding cambium. 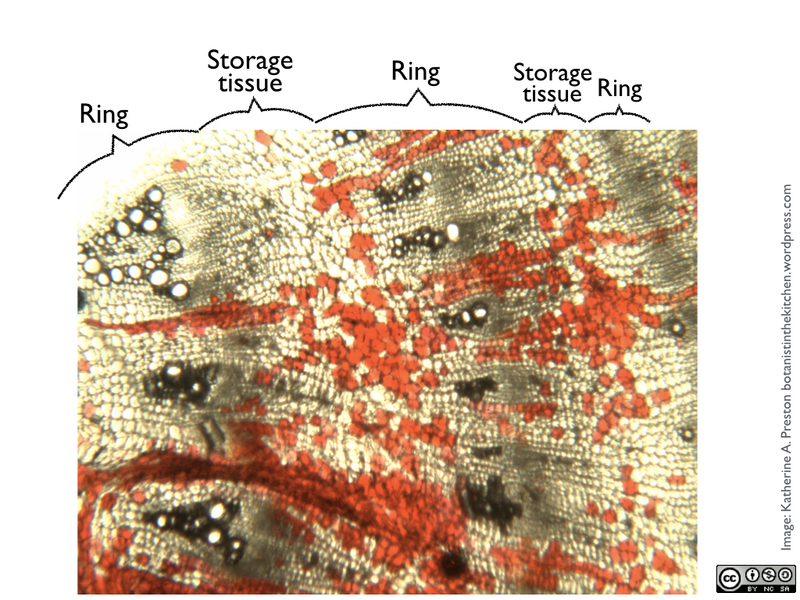 In a beet, the internal rings continue to make new vascular tissue. 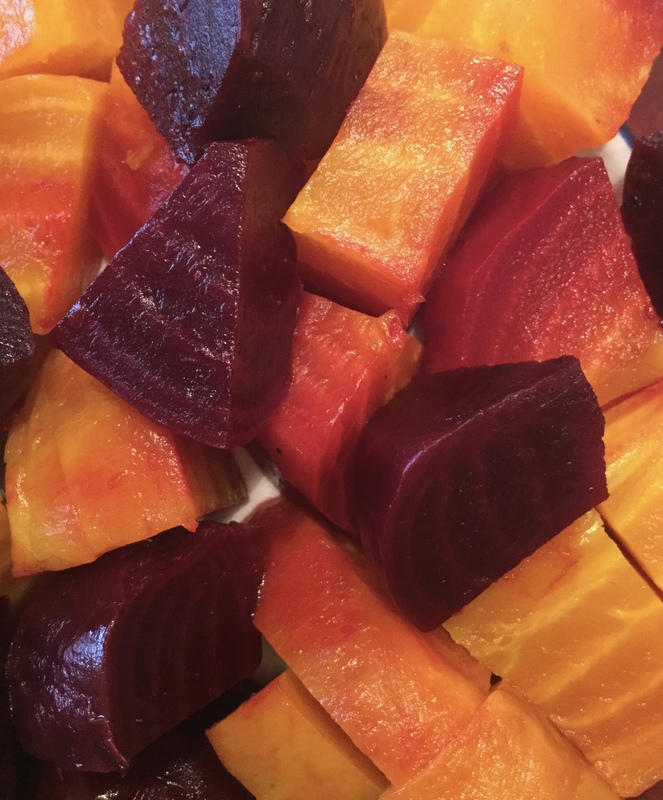 Another unusual feature of beets is that the vascular rings alternate with wide bands of soft sweet storage tissue made of large cells with thin walls. These cells are packed with betalain pigments. Although they are sometimes called “beetroots” (especially in England), the fat part of a beet is anatomically part stem (hypocotyl) and part root. These big red and golden knobs are built to store sugar that would support a second year of growth, flowering, and seed production if we did not harvest them first. (For an entertaining and sometimes suspenseful description of beet reproduction, see Norm Ellstrand’s popular books from 2003 and 2018). So what good do the rings do for the beet? It’s not clear, but renowned wood anatomist Sherwin Carlquist has written persuasively that they probably function extremely efficiently in moving sugar into and then out of storage (Carlquist, 2007). Close up of beet vascular tissue. The center of the beetroot is towards the upper left. 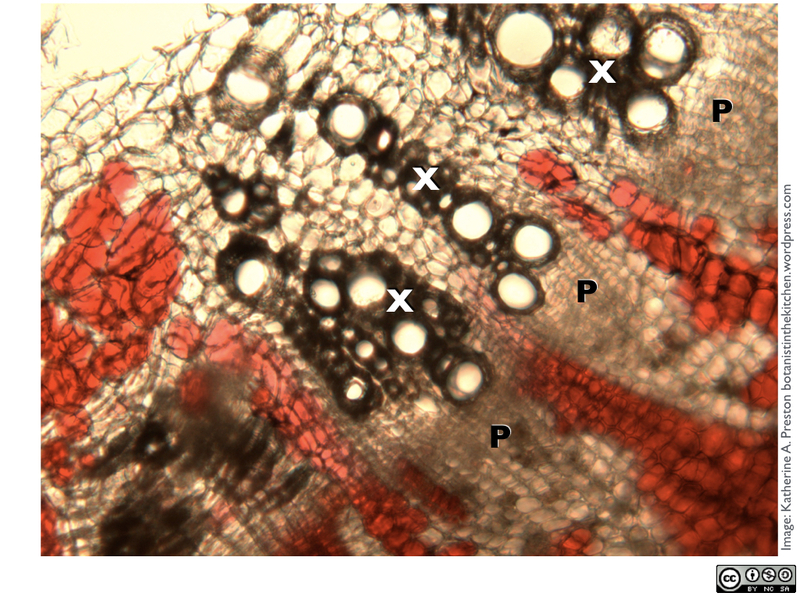 Xylem is marked with an X, phloem with a P. Click to enlarge. He notes that all the rings in a beet have well-developed phloem, but only the older rings contain any xylem, suggesting that moving sugar is much more important to beets than moving water. Other Caryophyllalean relatives with rings, such as the climbing shrub bougainvillea, don’t store as much sugar as beets do, and their rings include more xylem (Carlquist, 2007). All of the explanations above still leave us with unanswered questions. We know that beets taste like dirt because of geosmin, but what role does geosmin play in the life of the beet? We can describe the anatomy and function of beet rings, but their evolutionary origins and adaptive value in other species is still a mystery. And a beet’s brilliant colors are due to betalains, but why do beets favor those pigments over anthocyanins? The ancestor of all the Caryophyllales likely stumbled upon something that worked and just ran with it. Like many romances, it was probably a happy accident that stuck. It has been many years since the dirt stew incident, but the beet goes on in marital lore. While I allowed the glaring pink stains on the white beans to rebuke me every night for a week, my husband didn’t complain. He just laughed and ate around the offending beet chunks. Then he lovingly passed them over to me. No wonder there’s a warm place in my heart for beets. Beet cupcakes with beet-colored frosting. Anthocyanins don’t make good food coloring; the smaller bowl of frosting was tinted with pomegranate-blueberry juice and it’s just grey. The larger bowl required about a teaspoon of beet juice to become bright pink. These are basically carrot cake muffins, modified for beets. They have a beet flavor, just as carrot cake has a carrot flavor. Peel the beets (reserving peel for beet kvass, recipe below). Grate the beets by hand into a bowl or with a food processor to make a generous cup. (Use any extra beet in the kvass.) Extract about two teaspoons of beet juice by using your hands to squeeze the grated beets over a sieve set over a bowl. You may need to squeeze in batches. Mix the grated beets, yogurt, egg, orange peel, and vanilla extract. In another bowl, mix the dry ingredients. Stir the dry into the wet ingredients just until they are fully mixed. Spoon the batter into the cupcake pan and bake. Make half a batch of your favorite cream cheese frosting and add drops of the extracted beet juice until you achieve the color you desire. When the cupcakes are cool, decorate them with pink frosting. Wash the beets just to remove dirt, but don’t peel them. The peels carry the starting microbe culture. Chop them into large chunks and place them in the jar with the remaining ingredients. Fill the jar with water, leaving about an inch headspace. Cover the jar with a lid. Let the jar sit for 5-7 days, burping it daily if you don’t have a lid with an airlock. The kvass will be slightly fizzy. 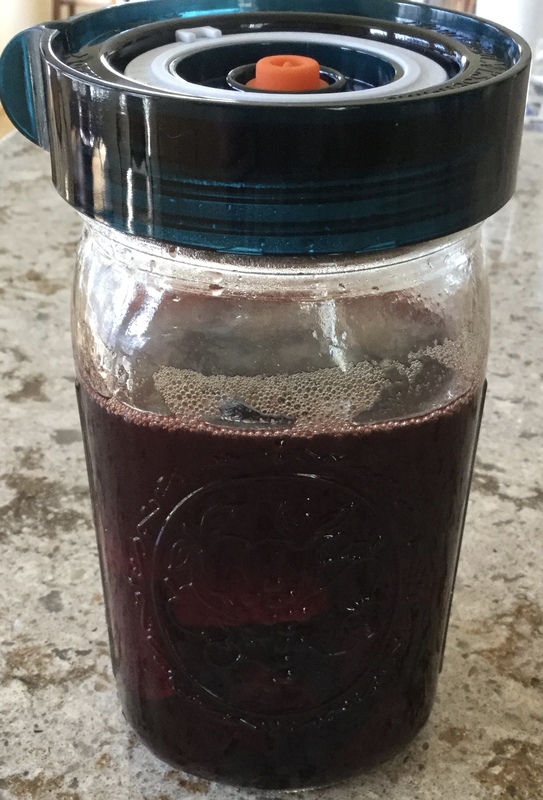 Strain out the beets and refrigerate the kvass. Cook the beet chunks if you like. Ellstrand, N. C. (2003). Dangerous liaisons? : when cultivated plants mate with their wild relatives. JHU Press. This entry was posted in Flavor, Recipes, Uncategorized, Vegetables and tagged anatomy, flavor, Katherine Preston, vegetable. Bookmark the permalink. As usual, both charming and informative! Thank you! Why loads and loads of pigment into an underground storage organ anyway? Would make sense of it’s a metabolic waste dump, but that doesn’t seem likely. Could be it’s made for leaves and their light-handling metabolism, like the anthocyanins are (at least in part) and the translocation into root is accidental, but again doesn’t strike me as too likely. Seems like it’s probably serving some purpose. Is the synthetic pathway to geosmin known, in the beet or the cyanobacterium? It sounds like probably not, if research is currently localizing the synthesis into the beet at all. Yes, that’s a great point about pigment in an underground storage organ. Sugar beet storage organs are white, and I assume wild sea beets’ are too. That would suggest that we selected for pigmented roots . The various color varieties support that idea as well. I have not looked into that history, however. Interestingly, another subspecies, mangolds (aka mangelwurzels), are golden colored even though they were developed as fodder for livestock (who presumably don’t care what color they are). “But beet-like rings are rare, except – you guessed it – in the order Caryophyllales” made me crack up!